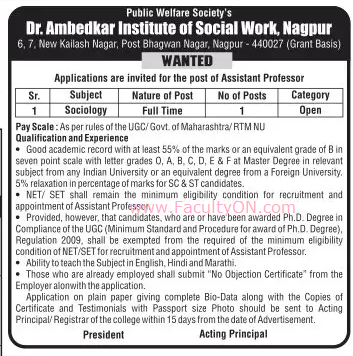 Dr.Ambedkar Institute of Social Work, Nagpur has advertised in the LOKSATTA newspaper for the recruitment of Teaching Faculty- Assistant Professor jobs vacancies. Interested and eligible job aspirants are requested to apply within 15 days from 20th September 2018. Check out further more details below. About College: Dr. Ambedkar College of Social Work a prestigious Social Work College, affiliated to Rashtra Sant Tukadoji Maharaj Nagpur University, is one of the first colleges of Social Work in the district of Wardha. How to Apply: Eligible and interested candidates are required to send their application only on plain paper with full bio-data, copies of certificates / testimonials and recent PP size photograph to the the postal address mentioned below.